Australia’s military-led operation to prevent boats carrying asylum seekers from reaching its shores has been hailed by Prime Minister Tony Abbott as a success, with over 100 days elapsing since the last boat reached its target. But in Indonesia - the country from which most of the boats previously departed - Australia’s tough new measures have stranded over 10,000 asylum seekers and refugees who can neither proceed to their desired destination nor, in many cases, return home. “I thought I’d be here two or three months, but it’ll probably be two or three years,” said Musa*, a 17-year-old Afghan asylum seeker who has already spent a year in Indonesia, the past seven months in an immigration detention centre in Makassar, in southwest Sulawesi Island. For several months after Australia launched Operation Sovereign Borders in September 2013, smugglers continued to organize passage for asylum seekers. However, those whose boats made it into Australian waters were invariably intercepted by the Australian Navy and either towed back into Indonesian waters and handed over to the Indonesian Navy or taken to one of Australia’s offshore detention centres where conditions have been described by human rights organizations as “inhumane”. Previously Australia and Indonesia cooperated on anti-people smuggling efforts through the Bali Process (a regional 50-member mechanism established in 2002 to combat people-smuggling), but the tow-backs have caused a breakdown in relations between the two countries. Attempts to reach Australia by boat have now largely been abandoned, both by the smugglers and their clients. “There’s no opportunity to go by boat; no one’s trying to go now,” said Aalim Allahyar, a 44-year-old refugee from Afghanistan who fled his home and business in Helmand Province after narrowly surviving 15 days of interrogation and beatings by Taliban soldiers that left his brother and sister-in-law dead. “There’s no choice. We have to wait,” he told IRIN. Allahyar has already been waiting for over two years, 11 months of which were spent in two different detention centres after failed attempts to board smugglers’ boats ended in his arrest. He now lives in accommodation provided by the International Organization for Migration (IOM) in the capital, Jakarta, along with 125 other refugees who are waiting and hoping they will be accepted for resettlement in Australia or elsewhere. Word that the prospects of reaching Australia by boat from Indonesia are now virtually zero appears to have reached smugglers and would-be asylum seekers in countries of origin such as Afghanistan, Iran, Pakistan and Myanmar. The numbers registering with the UN Refugee Agency (UNHCR) in Indonesia have dropped from about 100 a day during 2013 to about 100 a week now, said UNCHR country representative Manuel Jordao. However, even these lower numbers of new arrivals add to a caseload that stood at 10,567 (7,241 asylum seekers and 3,326 refugees) at the end of February. Asylum seekers and refugees are barred from working in Indonesia, which is not a signatory to the 1951 Refugee Convention and does not view local integration (one of the three durable solutions for refugees promoted by UNHCR) as an option. Now that sea routes out of the country have been closed off, the only way to move on from Indonesia is through deportation or voluntary return for those who do not qualify for refugee status, and voluntary repatriation or resettlement for those that do. In 2013, just under 900 refugees were resettled. So far in 2014, only about 100 have been resettled either to Australia or in a few cases, to the USA. Asylum seekers endure long anxious waits before they find out whether they have hit the resettlement jackpot and much of the waiting happens behind bars. There are currently close to 2,000 migrants and asylum seekers (including 364 children) in 13 immigration detention centres (IDCs) around the country. 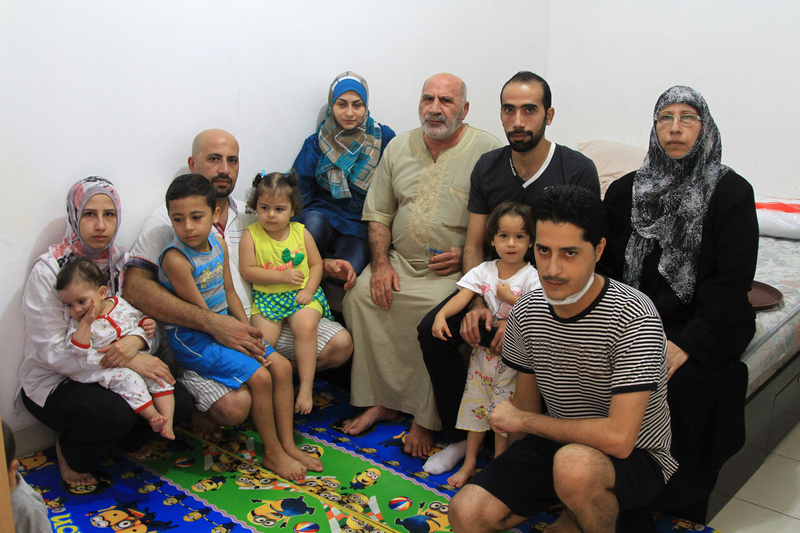 Hasan Kadad, a refugee from Syria, arrived in Indonesia with 12 of his family members, nearly two years ago. With very little information about the asylum system, he assumed they would have a short stay in Indonesia before proceeding to Australia to join his two sisters. But money to sustain his family soon ran out and other refugees advised him to register with immigration authorities in Jakarta. He did so and was promptly detained, along with his family who included three children under five, his elderly parents and pregnant sister. They spent a total of seven months in detention before his sister gave birth and they were transferred to IOM housing in Jakarta. Until recently, new arrivals with some remaining resources headed straight for places like Cisarua, a popular tourist area about 70km south of Jakarta, where they could live more cheaply than in the capital, exchange information with one another and connect with smugglers organizing boats to Australia. They could avoid detention providing their boats were not intercepted by the authorities. Now that boats are no longer departing, asylum seekers are exhausting their savings after a few weeks or months and increasingly making the decision to surrender themselves to Indonesia’s immigration authorities knowing that they will be detained for at least six months, but that they will receive food and shelter while they await the outcome of asylum applications. After nine months in Indonesia, Yahya Abaker Abdallah, from Sudan’s Darfur region, has almost reached this point. Abdallah had already spent 10 years as a refugee in a camp in Darfur before he sold all of his family’s livestock to pay a smuggler to bring him to Indonesia. Now he and three other Sudanese men are renting a room in Cisarua for 800,000 rupiah (US$70) a month, but “there’s no money left, and no help,” Abdallah told IRIN. Most asylum seekers are detained until their refugee status determination has been completed, a process that takes 12-16 months, according to Jordao who acknowledged that in areas where UNHCR has few or no staff, the wait may be longer. Families, women and children are not exempt and often spend months in detention before space becomes available in shelters and housing for the most vulnerable managed mainly by IOM. While UNHCR’s staffing capacity is stretched in Indonesia, especially outside Jakarta, IOM receives significant funding from the Australian government to support a staff of over 300, about half of which work on refugee-related projects. Coordinating with Indonesia’s Immigration Directorate, IOM supplies the IDCs with all of the detainees’ basic needs as well as paying for overflow accommodation and housing for vulnerable asylum seekers and refugees awaiting resettlement. The approximately 4,000 asylum seekers and refugees under its care each receive a monthly stipend of 1,250,000 rupiah ($110), just enough to cover their food and basic health care needs. يزعم ناشطون في مجال حقوق الإنسان أن الظروف المتردية في مراكز احتجاز المهاجرين في إندونيسيا تؤدي إلى وقوع أعمال عنف. وتقع العديد من تلك المرافق في مناطق نائية من الدولة، حيث تبعد في بعض الأحيان نحو 2,000 كيلومتر عن العاصمة جاكارتا.